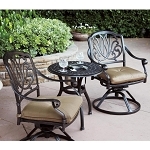 Bistro patio furniture is a good way to give your backyard patio a hint of European charm. You can give your patio the ambiance of a romantic French restaurant -- two chairs and a little, round table big enough for two people. The furniture is excellent when you have a friend over or if you and your significant other want breakfast or supper on the deck.